Enjoy hot summer nights in downtown Pleasanton. Sizzling Saturdays combines live music and entertainment on Main Street as you enjoy special promotions from downtown businesses and restaurants. Stroll through downtown and enjoy live music throughout Main Street while you shop and dine. See the list of participating businesses and promotions below during Sizzling Saturdays from 6-9 p.m. in August and September. One of the world's largest Celtic Festivals. 30 pipe bands. World Championship Heavy Events + Amateur, Woman's & Maters Invitational. Western Highland Dancing Championships. Living History - MaryQueen of Scots, Highland Warriors, Roman Legion & Invading Vikings. Gathering of Clans. Celtec Heritage - Fiddling, Harping & Singing. 6 stages continuous entertainment - traditional to Celtic Rock. Childrens Glen, Scottish Country Dancing. Irish Step dancing. Birds of Prey. Sheep Dog Trials. Clydesdale Horse Team. Five-A-Side Soccer, Rugby & Shinty Tournament. Whisky Tasting. British food & drink. 5 buildings with 100 + Vendors. Check web sites below for any updates. On Sunday of Labor Day Weekend, wineries celebrate the exciting crush season. Wine lovers have come from all over the Bay Area and beyond for the past 35 years to enjoy this unique event.This exclusive event is open only to ticket holders- don't miss out on a wine country celebration! Join us for live music, wine tasting, lawn games, food trucks and more. VIP guests will enjoy preferred parking, complimentary small plates of food, lounge seating, reserved shade areas, exclusive tasting of signature wines. Tickets include entrance into participating wineries, wine tastings, commemorative Livermore Valley Wine Country glass, wine discounts and a program. The 2017 Harvest Wine Celebration is a one day event, but you can make it a two day experience. Many wineries honor wristbands, have additional special activities, and are open on Monday. Admission: General: $55 presale through 9/1, $65 at the door. VIP: $85 presale through 9/1, $100 at the door. VIP guests will enjoy preferred parking, complimentary small plates of food, lounge seating, reserved shade areas, exclusive tasting of signature wines. All tickets include wine tastings, commemorative Livermore Valley Wine Country glass, wine discounts at select wineries on Monday and a program. There are NO non-drinking tickets available for this event. Parking: $5 per car. Complimentary for VIP Ticket holders. Livermore/Pleasanton Fire Departments, Safety Trailer & Fire Truck. No Pets allowed at the Fair. Join us Saturday, September 9th for a brand new event in downtown Pleasanton. Forkful is sure to be every foodies dream come true and an evening of culinary delight. This unique self-paced tasting experience will allow event guests to stroll through downtown stopping at 15 participating locations to taste their perfect forkful of food. Complimentary adult beverage tastings will highlight the food along the way. This event will allow event guests to truly experience the culinary landscape of downtown Pleasanton. Upon arrival, each event guest will enjoy a sparkling wine reception at check in where they will receive their commemorative rose gold fork and event program to guide them through the tasting experience. Check in will take place at the Museum on Main located at 603 Main Street from 2:30-4pm. The savory portion of the event will take place from 3-5pm and the sweet portion will take place from 4-6pm. Event guests will have the opportunity to enjoy the event at their own leisure within the event hours determining their own route using the program as their guide. Sandy and Richard will make you scream with laughter and tap your toes to their all-original, all-comedy cabaret, describing their cracked and bushwhacked road to marital bliss, social consciousness, and menopause. Their unique juxtaposition of modern, socially relevant lyrics and tune-smithy jazz piano/vocal arrangements will charm your socks off. Apple Picking, Cider Making, "apple slinkies"
Special apple tasting with Ranger "Apple" Amy at 2pm; all other activities onging. When James is sent by his conniving aunts to chop down their old fruit tree, he discovers a magic potion that grows a tremendous peach that rolls into the ocean and launches a journey of enormous proportions. James befriends a collection of singing insects that ride the giant piece of fruit across the ocean, facing hunger, sharks and plenty of disagreements along the way. The show features songs written by the Oscar�, Golden Globe�, and Tony Award� winning duo Benj Pasek and Justin Paul. On September 16 and 17, 2016, the Pet Food Express Bay Area Pet Fair will feature more than 80 California pet rescues and shelters in attendance, with over 1,000 adoptable dogs, cats & small animals. In addition, the event is an extravaganza for pet-loving families. Admission and parking is free, and there will be free live shows, free activities for kids and dogs, food trucks, lots of giveaways and loads of vendors. 4,760 homeless pets adopted, including 1078 in 2016! For the latest updates please visit www.bayareapetfair.org. Pacific Chamber Orchestra under Maestro Lawrence Kohl performs magical Beethoven�s Fourth Piano Concerto with Steinway artist Natsuki Fukasawa. A Fulbright scholar Ms. Fukasawa�s music career has taken her throughout U.S. cities as well as to Europe, Scandinavia, Israel, Australia, Brazil, Japan and China, performing at such venues as Carnegie Hall, Kennedy Center and Copenhagen�s Tivoli Concert Hall. Schubert�s Symphony No. 1 while clearly showing influences from Mozart, Haydn and Beethoven establishes his unique sense of flowing melodic line so characteristic of his song cycles. Wear your Hawaiian shirts, grass skirts, cowboy hats and boots! Fun photo booth, stick horse races, door prizes, games and refreshments. At the Robert Livermore Community Center, Palo Verde Room. Location: Robert Livermore Community Center, Palo Verde Room. Additional parking on Loyola Ave. The Quilt, Craft & Sewing Festival features a wide variety of supplies, notions, patterns and techniques in the areas of quilting, sewing, needle-arts, stenciling, embossing, crystals, fabric crafts and more. Many booths will feature new cutting edge products that are brand new to the market. Enter your ticket stub to win free door prize drawings that occur every hour. Our co-sponsor, Dublin Sewing, will also be giving away a free sewing machine making this a very exciting show for those with a creative flair! In addition to that prize, dozens of free door prizes will be called throughout the day. Of Navajo-Ute heritage, R. Carlos Nakai is the world�s premier performer of the Native American flute. Originally trained in classical trumpet and music theory, Nakai was given a traditional cedar wood flute as a gift and challenged to see what he could do with it. Since he began playing the traditional Native American flute in the early 1980s, Nakai has released more than 50 albums including �Canyon Trilogy,�which went platinum, the first for a Native American artist performing traditional solo flute music. In addition to traditional Native American music, he has also explored new age, world-beat jazz and classical styles. Nakai�s cross-cultural collaborations have included an album with the Wind Travelin� Band, a Japanese folk ensemble, and Tibetan flutist and singer Nawang Khechog. In addition to guitarist William Eaton and percussionist Will Clipman, with whom he is currently on tour, he has worked with flutist Paul Horn, composers James DeMars and Phillip Glass and several symphony orchestras. The recipient of numerous Grammy Award nominations and other awards, Nakai�s career has been shaped by a desire to communicate a sense of Native American culture and society that transcends the common stereotypes presented in mass media. Now in its 42nd year, the San Francisco Comedy Competition has helped launch a Who�s Who of comic champions. Over the years, legends such as Robin Williams, Dana Carvey, and Ellen DeGeneres have emerged from this stand-up comedy contest to become stars. Among the many competitions around the country, the format of the San Francisco Comedy Competition makes winning particularly challenging. The preliminary rounds consist of short stand up sets in six venues, which may include comedy clubs, bars, restaurants, casinos and theaters. Ten comedians proceed to the semi-finals for longer sets in six more venues, before moving to the finals, where the length of the sets increase to 12-15 minutes. Since 2015, the Bankhead Theater has become a popular stop, one of the last on the semi final circuit, where the competition keeps audiences on the edge of their seats � until they�re rolling in the aisle with laughter. 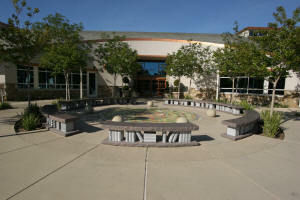 Sponsored by the Livermore Valley Performing Arts Center, Tree Sweater Forest is a fun and whimsical art installation. Knitters and crocheters make "sweaters" for 30 trees on First Street, Livermore. Yes, just for fun! They add a festive and vibrant ambience to Livermore's beautiful downtown for the fall season. Installation is Sat., September 23 and they stay up until November 18. When they come off the trees they are repurposed as animal comfort blankets at the Valley Humane Society of Pleasanton. For twenty seven years the club has held its Nostalgia Day Car Show on the streets of downtown Livermore, where the show has grown to display 700+ muscle cars, street rods, custom and classic cars and draws over 10,000 spectators annually. Our motto has always been "Cruisers Against Drugs", and our annual Nostalgia Day Car Show has allowed us to prove that we mean it. To date, this fundraiser has enabled us to donate over $460,000 for local organizations that promote the Tri-Valley youth, help strengthen their families and help keep kids off drugs & alcohol. See 2014 and 2016 show photos on the eLivermore.com photo site. Location: Hagemann Ranch, 455 Olivina Ave, Livermore. �Strum & Spirits� is a new, interactive, social way for beginners to learn to play the guitar, discover rock �n roll history, experience new wines and have fun doing it all! Guitarist/vocalist David Victor (formerly of the multi-platinum band BOSTON) takes each group by the hand and gently introduces the fundamental concepts of the guitar with a presentation spiked with storytelling and humor. It�s like a �paint-and-sip� class, only more rockin�! You need not know how to play the guitar at all! You�ll get more out of it if you know NOTHING. In fact, you DO NOT even need to own a guitar! David will provide up to 50 guitars for his guests (rental price applies, see tickets). You can also bring your own guitar if you wish. Come and learn about some new wines and learn to play some of the greatest rock �n roll songs ever written in an enjoyable, new, relaxed and innovative way. BONUS: At the Firehouse, our first 40 participants will find themselves on the beautiful Firehouse stage with David! David will finish the evening with a special acoustic performance of some of his favorite BOSTON songs and more that will blow you away! Original HEART band members and Rock �N Roll Hall of famers Steve Fossen (bass) and Mike Derosier (drums) and the �second incarnation� of the iconic Hall of Fame rock group! Heart By Heart�s mission is simple: create music that is authentic, passionate, and true to HEART�s original recordings. Lead vocals by Somar Macek, Randy Hansen on guitar, keyboardist Bob Rivers, and Lizzy Daymont on guitar and vocals. The Opening Night Gala for Donizetti�s Don Pasquale will be held September 30, 2017 at Uncle Yu�s at the Vineyard, conveniently located in downtown Livermore. The Welcome Reception will begin at 4:00 P.M. in order to accommodate a pre-opera lecture time of 6:30 P.M and a Curtain time of 7:30PM. Tickets are available for purchase at the Bankhead Ticket Office 925-373-6800 or online. Nick Liang will work with our wine sponsor McKahn Family Cellars to create a beautiful three course dinner beginning at 4:45 P.M. Specialty desserts will be served at the Bankhead Theater. A separate ticket will be needed to attend the opera performance of your choice. David Gately�s well loved Wild West version of Gaetano Donizetti�s classic Don Pasquale is an evening of fun, laughs and amazing tunes sure to satisfy everyone. Join us as we saddle up to tell the story of Don Pasquale, an ornery old thing who�s desire to be married soon fades when his much younger wife takes the reigns and drives his life out of control. It is a classic Spaghetti Western complete with gun totin� cowboys, saloon girls and bubble baths to set the stage for this evening of light-hearted fun. Sung in Italian with English supertitles. Admission: $90 / $75 / $65 / $52 / $42 Student: There is a $10 discount discount for some seats. Varies by performance. In addition to the Haunted Attractions, tickets include: Live Music, Mazes, Misfortune Tell, Frightmares Sideshow, Nightly Entertainment, and more. General Admission - $30.00 Six acres of scares, mazes, games, nightly entertainment and, of course, award winning Haunted Houses!